This was yet another book that I considered passing on. I sounded like it was going to be more of a thriller and as I said before on one of my other reviews, I have read a ton of thrillers lately and I am just kind of over done. Then this book started showing up all over my Instagram and once again I gave into peer pressure and decided to review it. I was taking the train up to Seattle and needed something that was going to be a quick read and I was kind of in the mood for a thriller. Let’s get this out of the way now…..this is NOT a thriller. Not even close. This is more of a family drama for lack of a better description. Let’s just say that once I picked this one up, I never put it down. I read it all the way on the train and immediately following once we checked into the hotel. I read it late into the night and finished it in about 8-9 total hours of reading. It was unbelievable! I am so glad I read this one! Minutes, days, weeks go by as Sarah becomes increasingly worried. But then she discovers she’s right. There is a reason for Eddie’s disappearance, and it’s the one thing they didn’t share with each other: the truth (summary from Goodreads). I am in love with everything about this book. The cover, the story, the characters. Everything. This book kept me guessing and was so heart wrenching. I absolutely loved it. 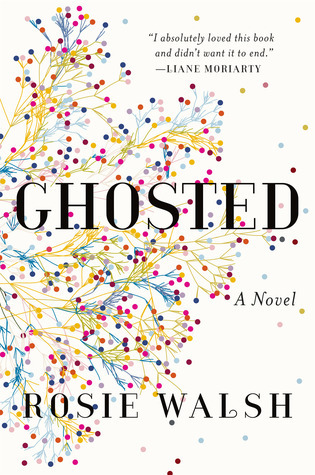 This is Walsh’s debut novel and I can’t wait for her to write another one. Sarah really stood out to me as such a real character. When someone says they are going to call and they don’t, it’s such a blow. As a woman, a million things are running through your mind. What did I do, is usually the first question. Having someone go ghost on you is so frustrating…..just be honest. Now that is easier said than done. I’ll be honest, I have ghosted people before but I was younger (in my early 20s) and wasn’t sure how exactly to break up with someone. Then I got married at 23 so my time ‘adult dating’ was limited to basically two years. Having to date in my thirties or forties, especially now a days, sounds so hard and complicated. Walsh captured that thirties demographic and dating experience so well. Sarah did things that I actually would consider doing as well. I thought she was a very accurate and realistic character and I loved her on so many levels. I also loved how Walsh plot twisted her character—it was brilliant and stood out so much to me as a reader. The first half of the book I actually thought I was going to read this grizzly murder thriller—-something along the lines of Gone Girl—but what I got was so much better! I don’t want to spoil anything for other readers but let’s just say that this was easily my favorite read this summer, if not the entire year. It was so well done and I couldn’t put it down. I can’t recommend this one enough! I thought about it long after I was finished and found myself wondering what I would do in Sarah and Eddie’s positions. Such an excellent read….I’ll stop now because I’m raving like a fangirl—go read this book. Do not think twice! One last note……whoever suggested changing the name of this book from The Man Who Didn’t Call to Ghosted was brilliant. I like Ghosted much better. To be honest, I probably would have passed on ‘The Man Who Didn’t Call’ even with this beautiful cover. Ghosted works so much better!